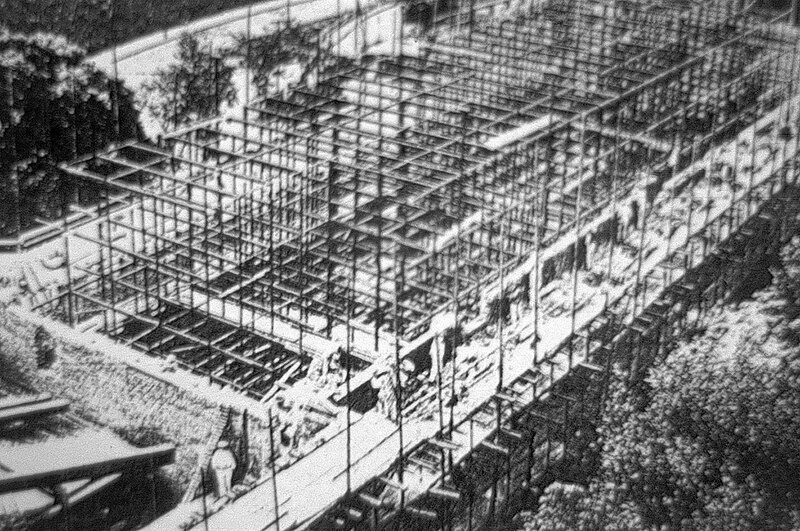 The German Military Archive under construction (Potsdam, 1939) from: Archivalische Zeitschrift, vol. 45 (1939). The ‘archive’ has become one of the most popular metaphors for all kinds of memory and storage agencies. But let us not forget, first of all, that the archive is a very precise (and thus limited) institution. The archivist knows that he ­operates in the arcana imperii, the hidden realms of power. There is a well-defined juridical ­purpose in keeping spatially and temporally away from public inspection documents which are relevant in administrative contexts; everything else being subject to discourse. The archive literally started by administrative definition – as archeion in ancient Athens once it became alphabetized, related to the new forms of commandment. Archival space is based on hardware, not a metaphorical body of memories. Its operating system is administrative; upon its stored data narratives (history, ideology and other kinds of discursive software) are being applied only from outside. Non-discursive practices are the reality of archives under a given set of rules – thus somewhat analogous to the transfer ­protocols in the Internet or the codes behind computer software. The archive is not the place of collective memories in a given society2 but rather the place of classifying, sorting (out) and storing data resulting from administrative acts, representing a kind of cybernetic feed-back option of data back to present procedures. Archived data are not meant for historical or cultural but for organizational memory (such as the state, business or media); real archives link autho­rity to a data storage apparatus. Starting out from the theory of cultural semiotics developed by Jurij Lotman, culture is a function of its memory agencies. Lotman has defined culture as a function of its ­inherent media, institutions and practices of storing and transferring cultural knowledge. Media archaeology looks in a non-anthropo­centric way at memory culture; it takes the presence of the archive, not narrative history as its model of processing ‘past’ data. Media archaeology – being concerned with signal processing rather than with semiotics – directs attention to the technological addressability of memory, discovering an archival stratum in cultural memory sedimentation which is neither purely human nor purely technological, but literally in between: symbolic operations which analyse the phantasms of cultural memory as memory machine. In the sense of the ancient notion of ­katechon (deferral), the archive suspends the merciless thermodynamic law of physics that all things tend to dissolve into disorder until death occurs. The archive manages to maintain order through a heavy investment of organizational energy. One function of the cultural archive is to ensure that improbable (that is, seemingly useless) data is preserved for future possible information (according to information theory, such as Claude Shannon’s). What remains from the past in archives is the physical trace of symbolically coded ­matter, which in its materiality is simply ­present in space. The more cultural data are processed in electronic, fugitive form, the more the traditional archive gains authority from the very materiality of its artefacts (parchment, paper, tapes) – an archival ­retro-effect. The archive does not tell stories; only secon­dary narratives give meaningful coherence to its discontinuous elements. In its very discreteness the archive mirrors the operative level of the present, calculating rather than telling. In the archive, nothing and nobody ‘speaks’ to us – neither the dead not anything else. The archive is a storage agency in spatial architecture. Let us not confuse public discourse (which turns data into narratives) with the silence of discrete archival files. There is no necessary coherent connection between archival data and documents, but rather gaps in between: holes and silence. It is this which makes the archive an object of media-­archaeological aesthetics: like archaeologists, media archaeologists are confronted with ­artefacts which do not speak but operate. This silence is power at work, unnoticed by narrative discourse. This power is analogous to the power of media, which depends on the fact that media hide and dissimulate their technological apparatus through their content, which is an effect of their interface. The syntactical power of the archive becomes ­visible only from a perspective which resists the desire for semantics. Archival memory is monumental; it contains forms, not people. Whatever is left of a person is a collection of papers or recorded sound and images. Here the emphatic subjects dissolves into a text of discrete bits. Whoever reads personal coherence into archival papers performs fiction, figuring dead letters in the mode of rhetorical prosopopoietics (naming dead things ‘alive’). Historical imagination, applied to archival readings, mistakes hallucinations for absence. Against the phantasmatic desire to speak with the dead, archival awareness faces the past as data. Counting is related to telling, but in an antagonistic way. When it comes to the question of memory in the age of digital ­computing, I refer to Lev Manovich’s essay on ‘Database as a symbolic form’:3 data models become dominant, dictating the ­narrative; databases invert the traditional relation between the paradigmatic and the syntagmatic. The non-narrative belongs to the archival regime. Archival information ­corresponds to the media archaeological mode, whereas narrative corresponds to ­discourse. Literary narrative (according to Gotthold Ephraim Lessing’s 1766 treatise Laokoon) is an art of organizing temporal experience; Henri Bergson insisted on human perception of time (conscience) as against chrono-photographic registering of temporal processes. Time itself is now being organized by technologies.4 The spatial meta­phor of the archive transforms into a temporal dimension; the dynamization of the archive involves time-based procedures. Walter Benjamin, in his 1936 essay ‘Der Erzähler’, states that experience, when cut of from epic traditions, can no longer be ­communicated in a narrative way.5 In contrast to this we can argue that information has to be immediately consumed through real-time analysis – which belongs to computing and signal processing, and is no longer nar­ratable. From a media-archaeological view, instead of ‘narrative memory’, a digital ­culture deals with calculating memory. The evidence of files in archives knew it already: data-based memory cannot tell but only count, in accordance with the administrative logic which produces such files. Narrative may be the medium of social memory; the medium of archives, though, is the alphanumerical mode in conjunction with materialities (of data support) and logistical programs (symbolic operators). Power is the area where narratives don’t take place; the rest is interpretation. The archive registers, it does not tell. Only metaphorically can it be compared to human memory – unless taken neuro­logically. If there are pieces missing in the archive, these gaps are filled by human imagination6 . The desire of historiography stems from a sense of loss.7 The archive is not the basis for historical memory, but its alternative form of knowledge. If all that is left from the past is paper (scripta manent), then reading should be taken as an act of recollection in its most literal sense – as a symbolic cultural technology, resulting in a paratactical form of presentation. Let us not write on the basis of archives or about archives, but write the archive (transitively). To mistake the archive for a place of social memory is to divert attention from becoming aware of its real memory power: the mechanics of storage media which operates asymmetrically compared to human remembrance. In Halbwachs’s writings on the social framework of individual memory the archive ­significantly does not figure. The (hidden) power of the archive relies on its materialities (the physical storage engineering) and its ­symbolic operations, resulting in a non-organic body of evidence. This systemic read only memory fundamentally differs from what Marcel Proust described as involuntary ­memory in the human subconscious (mémoire involontaire). The archive starts with acts of ­crystallisation, with reducing the disorder of processes into coded, grammatological structures – a mediatic in-between of loose coupling and rigid form. Here, the real takes place. The archive is not about memory but ­storage practices, a functional lieu de mémoire.8 Remembrance is external to the archive. But having become a universal metaphor for all kinds of storage and memory in the meantime, the ‘archive’ is defaced; its memory technology is being dissimulated in favour of discursive effects, just as multimedia interfaces dissimulate the internal, operative procedures of computing. What is required is a media-critical theory of the archive, pointing at its definition as coded storage. From spatial to time-based archives From a media-archaeological point of view, the traditional archive (as indicated above) becomes deconstructed by the implications of digital techniques. Since antiquity and the Renaissance, mnemotechnical storage has linked memory to space. But nowadays the static residential archive as permanent storage is being replaced by dynamic temporal ­storage, the time-based archive as a topological place of permanent data transfer. Critically the archive transforms from storage space to storage time; it can deal with streaming data in electronic systems only in a transitory way. The archival data lose their spatial immobility the moment they are provided with a purely ­temporal index (‘data’, literally). In closed ­circuits of networks, the ultimate criterion for the archive – its separateness from actual operativeness – is no longer given. The essential feature of networked computing is its dynamic operativeness. Cyberspace is an intersection of mobile elements, which can be transferred by a series of algorithmic operations. In electronic, digital media, the classical practice of quasi-eternal storage is being replaced by dynamical movements ‘on the fly’ as a new quality. Classical archival memory has never been interactive, whereas documents in networked space become time- critical to user feed-back. The traditional spatial, that is, archival order which still continues in institutionally and physically remote places is thus being accompanied by a dynamic archival practice of data mapping, by temporal, dynamic, process operations which differentiate traditional from electronic archives. Trace routers are not spatial, but temporal scouts. With the archive itself being transformed from an agency for spatialization of time into an ­ in-between ordering (arresting) of dynamic processes (deferring change by a momentary arrest), spatial architectures of the archive transform into sequentializing, time-critical, synchronous communication. Only what can be addressed can be loca­ted. In this sense the Internet generates a ‘new culture of memory, in which memory is no longer located in specific sites or accessible according to traditional mnemonics, and is no longer a stock to which it is necessary to gain access, with all the hierarchical controls that this entails.’10 Addressability remains ­crucial for mediated memory. In Plato’s dialogue Meno it appears as if the matter of memory is but an effect of the ­application of techniques of recall. When the indication of temporal ‘access’ data becomes the dominant feature in Internet research, the traditional archival order liquefies: ‘Informa­tional goods require access, not ­possession.’11 The networked storage model turns electronic archives into a gene­rative agency; the traditional classificatory indexing (by meta-data) is replaced by dynamic (though still rule-governed, ­protocol-governed) ­sorting.12 The archival does not reside in the content of its files, but in logistic cybernetics (the cyberarchive which is the object of ‘media archivology’). When parallel distributed processing in computers replaces traditional computer ­memory, data become temporally rather than spatially locatable. Considered as ‘une opération technique’, the archive becomes a cybernetic memory machine, a play of data latency and data actualization, retentions and protentions of the present. As long as documents remain within the reach of actual administrations, they are part of a powerful regime. Within the digital regime, all data become subject to realtime processing. Under data processing conditions in realtime, the past itself becomes a delusion; the residual time delay of archival information shrinks to null. In cyber ‘space’ the notion of the archive has already become an anachronistic, hindering metaphor; it should rather be described in topological, mathematical or geometrical terms, replacing emphatic memory by transfer (data migration) in permanence. The old rule that only what has been stored can be located is no longer applicable.13 Beyond the archive in its old ‘archontic’ quality,14 the Internet gene­rates, in this sense, a new memory culture. Digitalization of ­analogous stored material means trans-archivization. Linked to the Internet rather than to traditional state bureaucracies, there is no organizational memory any more but a definition by circulating states, constructive rather than re-constructive. Assuming that the matter of memory is really only an effect of the application of techniques of recall, there is no memory. The networked data bases mark the beginning of a relationship to knowledge that dissolves the hierarchy associated with the classical archive. The archive – while institutionally ongoing as an administrative and juridical memory of state or other corporations – on an epistemological level is transformed from an mechanism of adressability (read-only memory) into an arché in Foucault’s sense: a generative, algorithmic, protocol-like agency, literally programmatic. The digital (instead of analogue) archive is related to sampling in that respect. Already the traditional, text-based archive consists of digital elements, elementary letters of the alphabet. But in the digital age, the alphabet is reduced to a binary code which, in the Von Neumann architecture of the computer, no longer separates stored data and processing rules (as in traditional archives, where the files are kept in depots while the archival rules of procedures are kept in books or administrative meta-documents). When both data and procedures are located in one and the same operative field, the classical ­documentary difference between data and meta-data (as in libraries, where books and signatures are considered as two different data sets) implodes. Digitalized memory undoes the traditional supremacy of letters in paper-based archives; instead, sound and images enter as well which can be addressed in their own medium: melodies can be retrieved by similar melodies, images by images, patterns by patterns. Thus a new type of cultural-technolocial memory is being generated. What can be digitally ‘excavated’ by the computer is a genuinely media-generated archive. This opens new horizons for search operations in the Internet: digital images and texts can not only be linked to alphabetical addresses, once again subjecting images and sound to words and external meta-data (the archival classification paradigm), but they can now be addressed down to the single pixel from within, in their own medium, allowing for random search – ­literally ‘bit-mapping’, mapping (by) bits. There are different media memory cultures. European cultural memory is traditionally archive-centred, with resident material values (libraries, museums, 2500-year-old architecture), whereas the trans-Atlantic media ­culture is transfer-based. This is what Michael Hardt and Antonio Negri appropriately called Empire.15 In a media-archaeological ­analysis of power today, we (re-)turn from a territorial notion of empire to the original meaning of the Latin word imperium which means reaching out, extension, a dynamic transfer. When it comes to heritage, the archives of the us ­federal government do not simply store ­documents that according to the old archival tendency should preferably be kept secret, but instead ensure a memory imperative, a very mobile offering of its contents to the public, even advertising to make this memory circulate. If there were no copyright, every online user might take advantage of the fact that in digital networks the separation between archival latency and present actua­lization of information has already collapsed. There will be two bodies of memory in the future: analogue, material storage and digital information memories – translucent technologies of permanent data transfer. The archive is no longer the message of ­multi-media memory. 1. The Ancient Greek word ­‘metaphorein’ means ‘transfer’. 3. Lev Manovich, ‘Database as a symbolic form’, 1998. 4. See Dieter Thoma, ‘Zeit, Erzahlung, Neue Medien’, in Mike Sandbothe / Walther Ch. Zimmerli (ed. ), Zeit – Medien – Wahrnehmung, Wiss. Buchges, Darmstadt 1994, pp. 89–110. 6. Alice Yaeger Kaplan, ‘Working in the Archives’, in Yale French Studies 77, theme issue ‘Reading the Archive: On Texts and Institutions’, Yale University Press, New Haven 1990, pp. 103–116 (103). 7. Michel de Certeau, L’absent de l’histoire, Mame, Paris 1973. 9. Christoph Drosser, ‘Ein ­verhangnisvolles Erbe’, in Die Zeit, 23 June 1995, p. 66. 10. Howard Caygill, ‘Meno and the Internet: Between Memory and the Archive’, in History of the Human Sciences, vol. 12, no. 2 (1999), pp. 1–11 (10). 11. N. Katherine Hayles, ‘Coding the Signifier: Rethinking Processes of Signification in Digital Media’. Lecture at Humboldt-Universität, Berlin, 11 May 2001. 12. See Elena Esposito, Soziales Vergessen. Formen und Medien des Gedächtnis der Gesellschaft, Suhrkamp, Frankfurt 2002, p. 43. 13. Harriet Bradley, ‘The Seductions of the Archive: Voices Lost and Found’ in History of the Human Sciences, vol. 12, no. 2 (1999), pp. 107–122 (113). 14. Jacques Derrida, Mal d’archive, Gallimard Paris 1985. 15. Michael Hardt and Antonio Negri, Empire, Harvard University Press, Cambridge (Mass.) 2000. Wolfgang Ernst is a professor of media theory at the Humboldt-Univer­sität in Berlin.